Prof. Dr. Anabel Ternès founded several start-ups and social campaigns worldwide. She has a strong background in marketing, sales, business development and in the lifestyle sector in international management positions. She is involved as a global ambassador in the ‘trade not aid’ jewelry initiative SAME SKY, as an ambassador for MAKE A WISH and is in close cooperation with the Peter-Ustinov-Foundation. Currently Anabel is working for GET YOUR WINGS, which is supporting the education of children around the world, and PRO FLÜCHTLING, a meta initiative, which is supporting refugees during their steps into work. 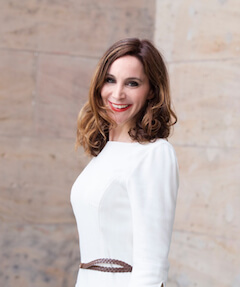 Anabel is managing director of an investment company, supporting sustainable business models and of the International Institute for Sustainability Management (IISM). She is professor and guest professor for Communication Management and E-business, currently teaching at SRH University Berlin, University of Art Berlin and German University in Cairo. » Digitalization and Nature - a Symbiosis? » Is Mindfulness an Urban Trend? » Restaurants – How to Select the Right One?